This isn’t your great-great-great-grandfather’s Hamlet. 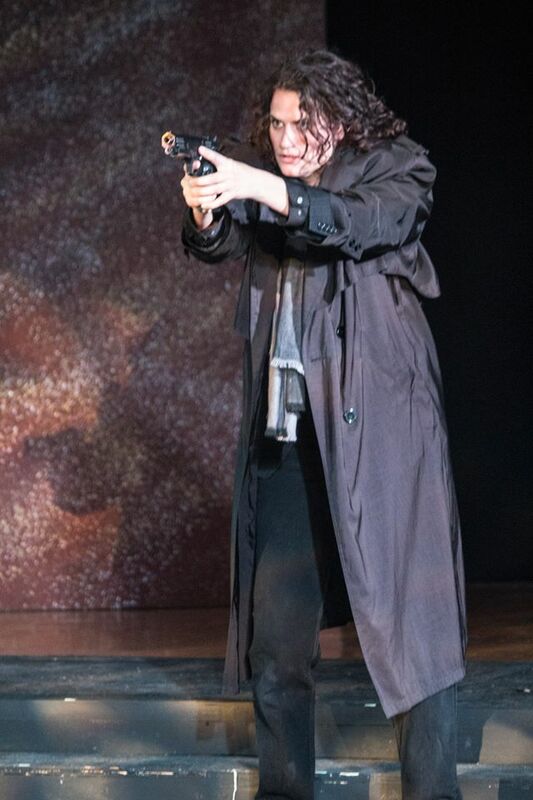 In St. Louis Shakespeare’s new production of the oft-produced classic play, Hamlet is played by a woman (although the character is still portrayed as male), the castle guards brandish automatic rifles and Hamlet himself carries a handgun and a large hunting knife, the usurping King Claudius and his court are dressed to the nines in dapper suits and chic gowns, and Rosencrantz and Guildenstern take selfies with their smartphones in the palace. All of these ideas could easily come across as cheap gimmicks, but in director Donna Northcott’s bold new staging, all of these elements work together along with a palpable sense of tension and urgency to create a fresh, exciting and thoroughly fascinating production that never bores and frequently captivates. The story is familiar to anyone who studied the play in English class or saw one (or more) of the many filmed versions of the story, or saw one of the many, many staged productions that have been produced for generations. Just as it says in the title, it’s about Hamlet (Maggie Wininger), the Prince of Denmark whose father, the King, has recently died and been succeeded by Hamlet’s uncle Claudius (Ethan H. Jones), who has also rather quickly married the King’s widow, Hamlet’s mother Gertrude (Kelly Schnider). When Hamlet is visited by the ghost of his late father (Tom Moore), he is informed that Claudius is not only an opportunist but a murderer, and Hamlet is encouraged to take revenge. Much of the drama that ensues revolves around Hamlet’s wrestling with what to do about this charge. This version of the play is set on a very simple stage, but with all the right trappings to suggest an elegant royal court. It’s all efficiently designed by Pippin McGowan and sumptuously costumed by Michele Friedman Siler. The men wear the finest, most stylish suits and the women are in fashionable gowns and jewelry. Gertrude is appropriately regal, and Ophelia (Taylor Steward) wears flowing, patterned dresses. The younger, flashier Rosencrantz (Paul Edwards) and Guildenstern (Shane Bosillo) are given more obviously trendy outfits, and Hamlet spends a fair amount of time dressing down in ripped pants and a wrinkled hoodie. The palace guards are imposing in camouflage, and the court attendants wear military-like livery. It’s all very well thought-out and consistent with the updating of the production. Also, while the guards, Hamlet and Laertes do carry guns at key moments in the show, the iconic sword duel at the end is still there, using modern fencing equipment and excellently choreographed by Erik Kuhn. With the excellent, dynamic staging of the piece, none of the updates seem out of place and all work to serve the story, actually adding to the accessibility and overall drama of the play. The cast, like the overall production, is uniformly excellent. Wininger, with her short-ish, curly mop of a hairstyle and brooding energy, is a particularly intense and youthful Hamlet. While she never completely manages to make me forget the fact that she’s a woman playing a man, Wininger’s wonderful and richly nuanced performance makes that distinction work in her favor. Her Hamlet is among the more collected portrayals I’ve seen, clearly showing the character’s self-examination and struggles with indecision and doubt. This Hamlet also shows obvious affection for the visiting Players, with the scene of their arrival and Hamlet’s interactions with them being among the most memorable and effective moments in this production. She also notably shines in her scenes with Schnider’s Gertrude and with Edwards and Bosillo as the ever-present Rosencrantz and Guildenstern, whose memorable and somewhat flighty characterizations are another notable aspect of this production. Schnider is excellent as Gertrude, as well, eschewing the somewhat silly, distracted characterization I’ve seen so many times for a more elegant portrayal. Whatever her own personal flaws may be, this Gertrude clearly loves her son and is concerned about his well-being. Jones, who also played Claudius in Equally Represented Arts’ excellent re-imagining–called Make Hamlet–earlier this year, here portrays the King in a self-doubting, considered characterization that gives weight to his famous “attempted prayer” scene. Michael Amoroso is another stand-out as an earnest, single-minded Laertes. There are so many excellent performances here that it’s difficult to name them all without naming the whole cast. There’s Steward’s waifish, bewildered Ophelia, Richard Lewis’s gently officious Polonius, Ben Watts’ fastidious and attentive Osric, and more. It’s a great cast in a very strong interpretation of the show that brings the audience into the action just as it brings the characters to the audience by the very skillful updating of the setting. One of the reasons I love Shakespeare so much is that his plays are so adaptable. While some interpretations have come across as more stunt than substance, there’s so much capacity for updating that clarifies the story rather than confusing it, especially in the hands of a good director with a consistent vision. This production is a prime example of the good kind of updating. It’s style and substance, elegance and drama, emotion and action, and ultimately, it’s a thoroughly convincing production. This is a Hamlet with heat, energy and immediacy, as well as some well-placed humor at the right moments. It’s one of the better examples of a “modern dress” staging of Shakespeare that I’ve seen. It’s a strong opening to St. Louis Shakespeare’s 30th Anniversary season, and it makes me look forward even more to seeing what else this company has in store. When I say Hamlet, I would imagine most people would know what I’m talking about. It’s one of Shakespeare’s best-known plays, and it has been subject to volumes of literary and theatrical criticism and enjoyed numerous productions over the past few hundred years. There have been so many conflicting interpretations, although most of the ones I’ve seen are still basically the same story with a few differing style and/or characterization elements. 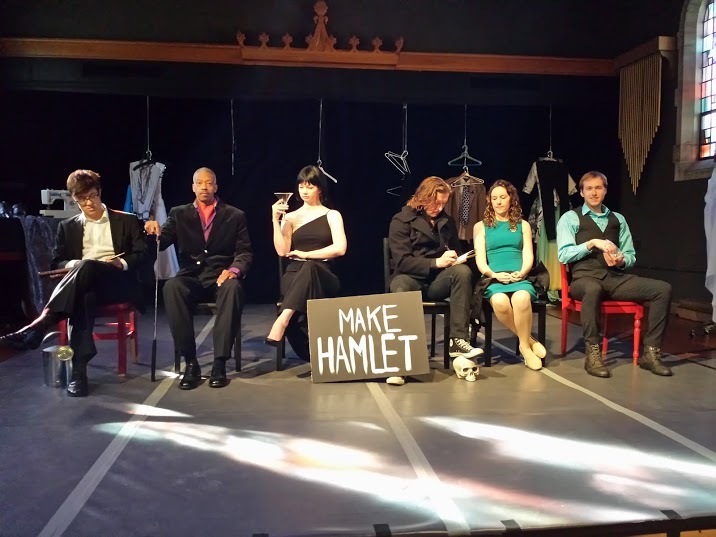 With this new production, called Make Hamlet and produced at The Chapel arts venue by Equally Represented Arts, director/adapter Lucy Cashion and her cast are presenting a take on the classic show like I’ve never seen it before. In this audacious re-imagining of the material, the ERA company challenges the audience to re-examine what we think about this much-performed and studied work, as well as reflect on the art and craft that goes into making and presenting a play. This is a somewhat condensed, re-arranged, visually striking production that uses all of its technical resources to the fullest, and takes the cast members everywhere throughout the performance space, from the stage to the back of the performance space, to the audience and even perched on the pews that line one side of the venue. The space is adorned with various implements of gardening and sewing (a watering can, a window basket of flowers, a sewing machine, sewing patterns, etc. ), suggesting a motif of creation and growing, and we see this process as the “backstage” is onstage, and characters change costumes and adjust the set in full view of the audience. The six member ensemble presents their characters with distinctive interpretations, as well–confrontational, larger-than-life Hamlet (Nick Henderson), earnest and determined Horatio (Mitch Eagles), fast-talking and detached Claudius (Ethan H. Jones), aloof socialite Gertrude (Julia Crump), moody and conflicted Ophelia (Jennifer Theby-Quinn), and relatively mild-mannered Laertes (Will Bonfiglio). 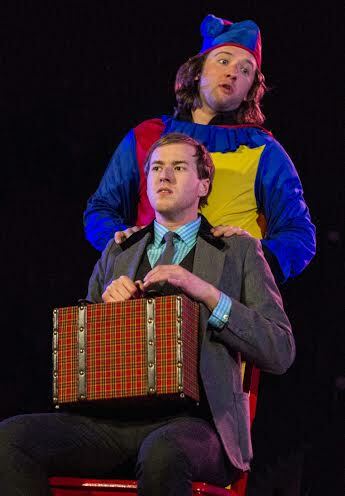 The other characters in the action are mostly referred to but not seen, with two notable exceptions–the Ghost of Hamlet’s father, which is rendered by a actors manipulating an intensely-backlit dressmaker’s dummy; and Polonius, who is “played” in most scenes by a colorful clown costume on a hanger, except in the memorable and somewhat disturbing take on the scene in which Polonius offers Laertes advice before Laertes returns to school and then warns Ophelia concerning Hamlet’s romantic attentions. I say “disturbing” because it’s not entirely clear if Henderson is supposed to simply be Polonius in these scenes, or if he is portraying Hamlet-as-Polonius. The reactions of Bonfoglio and Theby-Quinn certainly suggest that something isn’t exactly right. And then there are the scenes where famous speeches are delivered several times by different characters, or when the characters break into song, such as Gertrude absently singing The Beatles’ “A Day in the Life” and Ophelia’s darkly jarring rendition of “My Heart Belongs to Daddy” at a key moment. This is a take on Hamlet that recasts the story as more of a dark farce than a straightforward tragedy, and it works surprisingly well, with the staging and characterizations in keeping with that style, and it’s also all very 2014. Claudius’s “crown” is golf club. Hamlet wields a large, shiny pair of sewing scissors as a sword in one scene, and he and Laertes duel with garden clippers in another. Hamlet and Ophelia share a ballet-inspired dance as Ophelia chats with her father on a cell phone. Bright LED flashlights, sounds of sewing machines, rain, and ominous music help set the scene and the mood, and in a particularly intriguing conceit, character deaths are portrayed by having them remove their costumes, leaving their “shed skin” behind. Hamlet and Horatio play out something of a volatile “bromance”,with the rich-voiced Henderson portraying a Hamlet who is alternately sympathetic and downright menacing, and Eagles–who physically reminds me of Harry Potter–in an endearing performance as a noble, hipsterish Horatio. Theby-Quinn, in an excellent turn as a particularly intense Ophelia, swings wildly from coquettish to annoyed to fiercely unhinged, pelting the other characters with spools of thread that represent herbs in the most violent rendition I’ve seen of her well-known “madness” scene. These three are the real stand-outs in this cast as far as I’m concerned, and I was especially surprised at how much emphasis this production focuses on Horatio specifically. 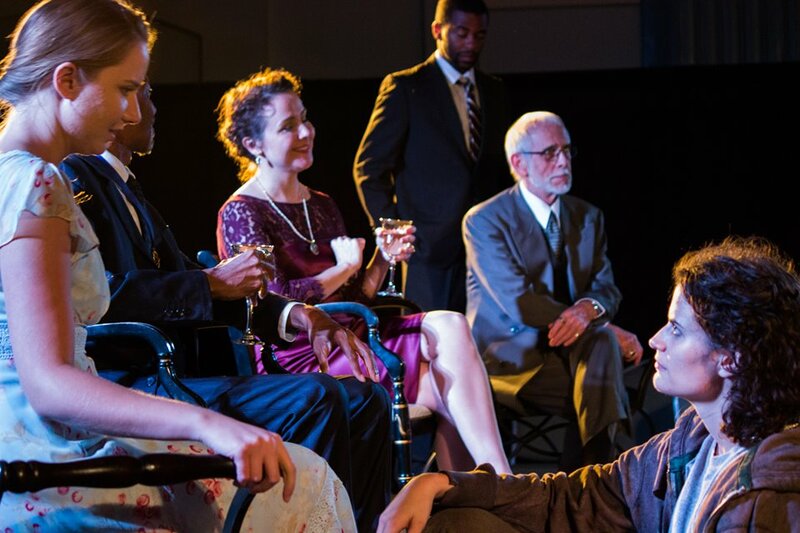 All six players put in good work, however, and the ensemble scenes are well-staged and convincingly played, concluding in a truly riveting finale. I feel so much at a loss to adequately describe everything that goes on with this production. I could overuse adjectives like “bold”, “daring”, “dark”, “witty”, “audacious”, etc. This production certainly is all those things, and it takes the Hamlet story and the characters in directions that I’d never thought of before. I’m sure it will be the catalyst for some excellent conversations about this play, its characters, and what it all means. As wonderful as the cast is, much of the credit for the success of this production goes to Cashion, who not only adapted and directed it, but also designed the set and the wonderful sound effects. It’s such a fully realized, consistent vision, played out expertly by this great cast and crew. There’s a lot of Shakespeare happening in St. Louis this week, with the celebration of the Bard’s 450th birthday and Shake 38 taking the Bard’s works to various neighborhoods and venues throughout the area. Even the midst of all those works, however, this one is a must-see. As a truly challenging, entertaining and engaging new presentation of an oft-performed show, ERA’s Make Hamlet is a winner. It’s a Hamlet for the 21st century, and it’s not to be missed.